Wild Turkey is 20 paylines and 5 reels video slot game presented by NetEnt software platform. 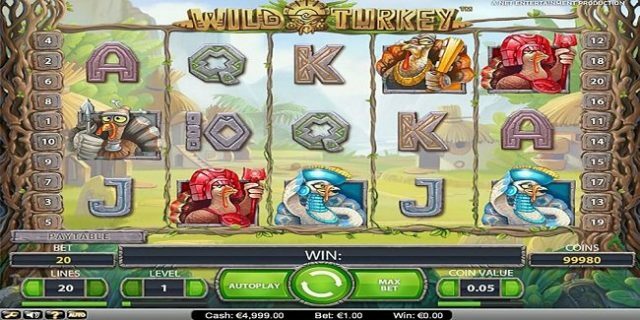 This slot is inspired by Wild Turkey and the wild symbol in this game is the eponymous Wild Turkey, which gives free spins as well. Players can play this slot at any Net Entertainment online casino sites for free or with real money. This slot has minimum coins per line 1 and maximum 10, while minimum and maximum coin sizes for this slot ranges from 0.01 to 0.5 per spin. This slot offers a jackpot of 4000 coins on your bet and return of the player percentage i.e. 96.6%. In order to play this slot, you should know some facts about it. The slot includes options such as “Lines” and “Coin value” and they can be used to change the bet level and to change the coin size. Spin button will start the game and ‘max bet” will spin the reels at the highest wager available. The Auto Play option is also available in this game which can be used by a player if he or she wants to play or spin the wheels without any interruption. If a player land on 3 or more of the wild symbols on any active reel, he would receive free spins. 3 wild symbols will give you 15 free spins and 4 wild symbols on reels will provide you 30 free spins. Just like this if you land of 5 wild symbols on any active reels, you would receive 60 free spins. If you land on 5 Red Turkey symbols, you would receive 4000 coin jackpot as well.